My Thoughts: After winning big at the Golden Globes and netting 14 total Academy Awards nominations (ties Titanic and All About Eve for most all time), this looks to be La La Land‘s award to lose. Manchester By the Sea receiving a nomination is a big win for Amazon Studios. Between this and recent Emmy success, Amazon and Netflix are proving that online streaming companies are changing the entertainment game. Hidden Figures could pull an upset. It won for best ensemble cast at the Screen Actors Guild Awards on January 29 and has been doing well at the box office in the weeks leading up to the Oscars broadcast. Lastly, why were no animated films nominated? There were some truly brilliant films this year and the Academy can nominate ten films. I feel this is a huge snub. My Thoughts: My personal pick in this category would either be Denzel or Garfield as I’ve long been a fan of both. It is hard to bet against Affleck though. Despite (or perhaps in spite of) the controversy surrounding him and the backlash it could cause if he won, Affleck has been racking up awards for his performance. He has to be the favorite right now. It should be noted that Gosling and Affleck both took home Best Actor at the Golden Globes (Comedy/Musical and Drama respectively) while Denzel won at the SAG Awards. My Thoughts: This is the most controversial category this year in my opinion. I find it surprising that neither Amy Adams (Arrival) nor Taraji P. Henson (Hidden Figures) were nominated despite both their films being nominated for Best Picture and both receiving high praise for their respective performances. As for those actually nominated, Stone and Huppert took home the honors at the Golden Globes, so they have to be the favorites. Stone probably takes the edge after also winning at the SAG Awards, but there are other strong contenders. Portman has been getting a lot of talk for her “transformation” in Jackie. My Thoughts: Consensus is that Ali has this one locked up, especially since surprise Golden Globe winner Aaron Taylor-Johnson didn’t even get a nom. This is also backed up by Ali’s win at the SAG Awards. My Thoughts: Viola Davis. That is all. I don’t know why anyone else was nominated. In my opinion, she probably deserves to win all the other acting categories too. My Thoughts: As with most of the Academy Awards that La La Land is nominated for, this one seems to be a foregone conclusion. Chazelle, who also won at the Golden Globes, is likely to win this one. My Thoughts: A little surprised that Finding Dory was not nominated here (it is hilarious!). My pick would be Zootopia as I think it may be the best animated film Disney has made in years. However, Moana could take it in a year that has seen the Academy Awards strive for more diversity (Moana features the first Polynesian Disney Princess). There is also a possibility that the two Disney films could split the votes and lead to an “upset.” If this happens, my personal pick would be Kubo. My Thoughts: “How Far I’ll Go” is almost the clear winner here. With all his other success, songwriter and composer Lin-Manuel Miranda (Hamilton) is on the verge of becoming only the third person to earn a PEGOT (Pulitzer, Emmy, Grammy, Oscar, Tony) in a lifetime. That is quite an achievement… and one that I think will happen. Of course this is only a partial list of all the awards and nominees. 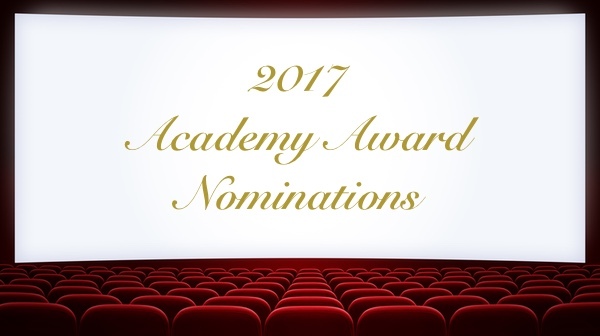 For a full list of categories and nominations, please visit the official Academy Awards website here. 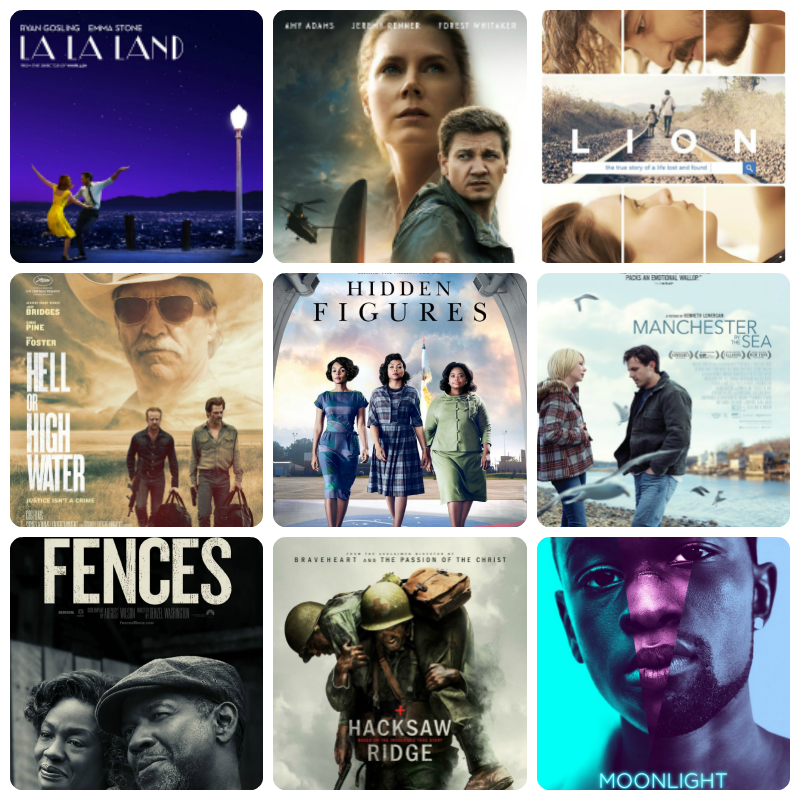 Who do you think will take home the big awards come Oscar night? Be sure to follow me on Facebook, Twitter, and Instagram and let me know!